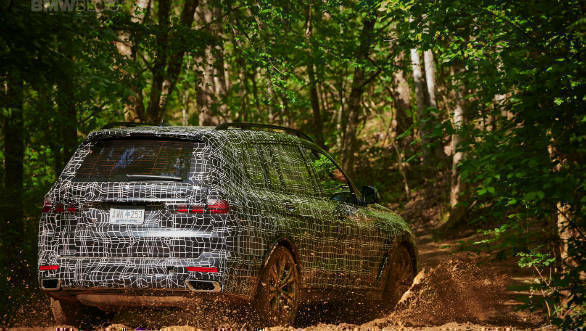 BMW seems about ready to reveal its latest flagship SUV, the X7. 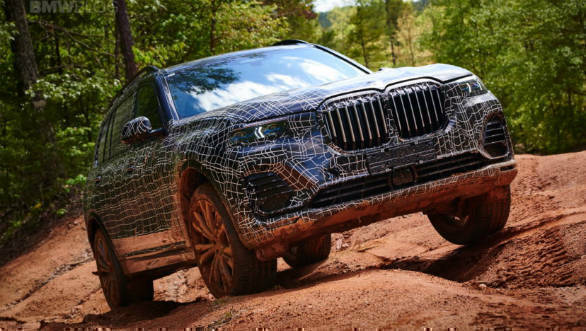 The German manufacturer has teased the BMW X7 with an image on its social media, stating the next big thing is coming soon. 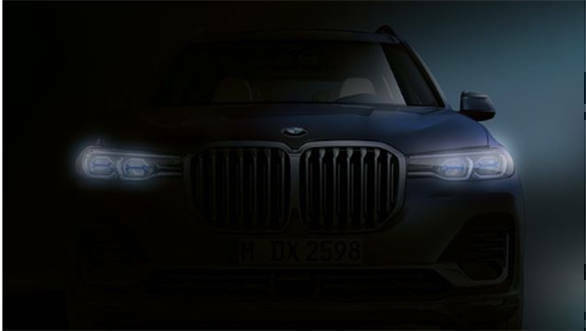 The BMW X7 teaser image features the front of the SUV, which looks rather imposing. It is close to the Concept X7 iPerformance showcased a few months ago. The SUV will launch in international markets at the beginning of 2019 and should reach India later that year. Given the timing of the reveal, the car will probably be one of the highlights of the LA Motor Show in November. This X7 will also most likely be followed by the usual BMW derivatives like a performance-oriented X7 M, a coupe X8 and an electric iX7 over the next couple of years. The car will sit above the X5 in its range and is the first three-row SUV from the German car-maker. Dimensionally, the car will be similar in size to the Mercedes-Benz GLS-Class. The car has an altogether more upright stance when seen alongside other BMW SUVs. the front has a massive iteration of the kidney grille which is flanked on either side by slim all-LED headlamps. These sit above an aggressive looking bumper with large air inlets The sides profile is relatively subdued with only a single shoulder line running the length of the car. Wheel sizes are a substantial 22-inches. The rear gets a split tail-gate, much like the Range Rover, which can support weights of up to 150 kgs. The interiors can be expected to come with tech and refinement features at par with the 7-Series. All three rows have large amounts of space for occupants and two seating options will be made available. One six-seater option with two captain's chairs in the middle row or a seven-seater with middle bench seat. The interior comes with two 12-inch touchscreens, a new design for the centre console which incorporates Swarovski crystal elements, advanced gesture control functions and panoramic sunroofs for all three rows. Engine options are the regular BMW fare, three options will be available at launch. Two 3.0-litre twin turbo straight six options in petrol (X7 40i) and diesel (X7 35d). This will be joined by the range-topping 4.4-litre twin-turbo V8 petrol (X7 50i). There are expectations of a flagship X7 60Li V12, but like the 7 Series, no X7 M will be made available. Other versions like an X7 40e hybrid four-cylinder and base RWD model will be made available later. All versions will come equipped with the 8-speed automatic. Active drive modes and an optional rear-wheel steering system will also come a part of the package. The SUV will be BMW's response to its main rivals offering increasingly high-end SUVs. 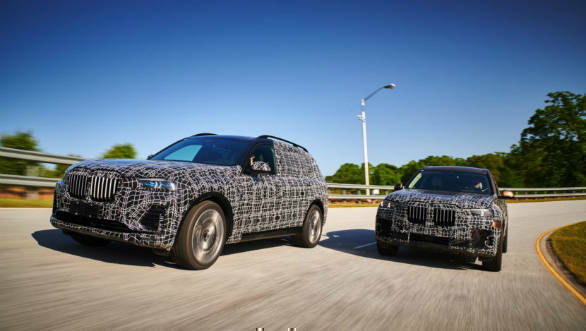 Buyers, especially in China and USA, have shown a great appetite for ultra-luxurious SUVs and this seems like a logical addition to the portfolio of an upmarket brand like BMW. 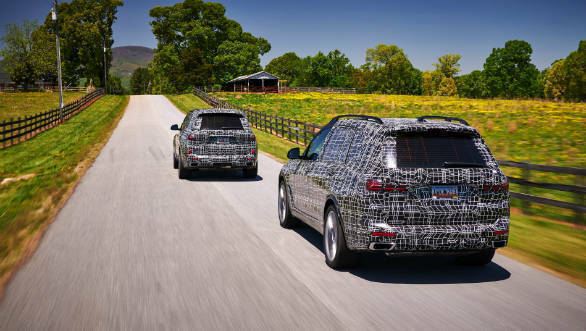 The BMW X7 will compete with the likes of the Range Rover, the Mercedes-Benz GLS-Class and the upcoming Audi Q8.